Congenital nevi are present at birth and may range in size from less than one centimeter to the giant "bathing trunk" nevus, which covers a large area of the body. Skin texture may range from normal to raised, nodular to irregular, and they are frequently darkly pigmented. 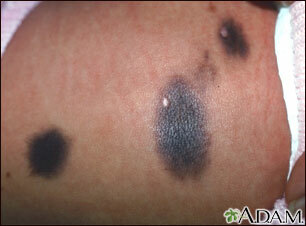 Melanomas may develop more easily in congenital nevi.